Coco II's Story . . .
Update 03/19/2013: "Coco was returned to MAESSR by his adoptive family due to anxiety when around their young children." Coco was returned to MAESSR by his adoptive family due to anxiety when around their young children. 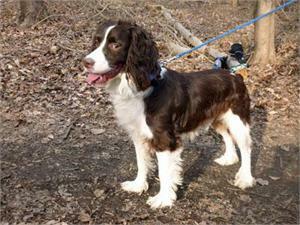 The family dropped Coco to a new foster home and aided with introducing Coco to the resident springer in the back yard. The resident ESS handily established herself as the alpha dog with an occasional quick growl. Coco acknowledged her assertions appropriately by backing off. Coco walks nicely with the resident springer. He is passionate about going outside but doesn't jump the fence or dig and is not a flight risk. He loves to bark at the birds. 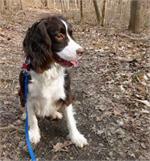 A classic Velcro springer, Coco follows his foster family from room to room. He is energetic without being hyperactive and will settle quietly in the house. Coco is interested in barking at cats, but is not aggressive towards them and will stop barking upon correction. He seems interested in chasing them, but the resident cats are used to dogs and tend to stand their ground. When going outside Coco comes eagerly to be harnessed or leashed and sits nicely even before a command is given. His recall is very good. He loves to play catch with a tennis ball and is very cooperative in returning the ball. He also is an expert at catching treats! He doesn’t like being gated in the kitchen and knocked the pet gate down. Fortunately for everyone, he does great with run of the house, without any accidents, and has displayed no destructive behaviors when left for a few hours. At day’s end Coco sleeps on the floor of the master bedroom, next to the resident springer. He generally does not get on the furniture or the bed. Summing him up………Coco would be a happy companion in a variety of adult homes without children. He bonds deeply and easily with adults and will be an awesome addition in the right home. Original: "Positive reinforcement works well with Coco." 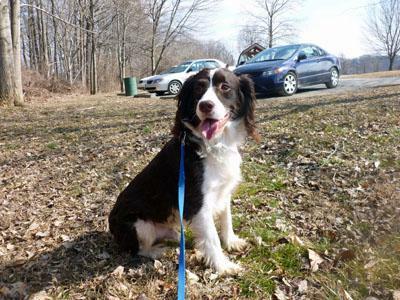 Coco came into MAESSR’s care because his Pennsylvania family did not know how energetic a young ESS can be. He was well-loved by his family and he was very attached to the mom, spending a good deal of time cuddled up next to her. However, busy with two children ages two and six, the family found they could not provide the time and energy to Coco that he deserved. Housetrained, Coco signals that he wants to go out by simply walking to the door. Not crate trained, he has been fine having full run of the house during the day when his foster mom is at work. At night he sleeps on his dog bed outside of the master bedroom. 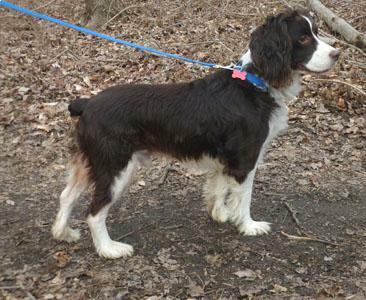 This young Springer behaves very well in the house with the exception of counter-surfing. He leaves the trash alone and does not chew inappropriately, though. On the other hand, Coco devours chew toys and stuffed animals. Hey, no Springer is perfect! Coco knows the commands “sit,” “stay,” and “shake,” and has good recall. 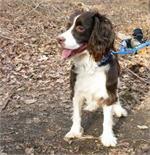 When walking on a leash, Coco pulls so his foster mom has been working on obedience training with him on walks. He’s much improved and has a strong desire to please – which is helpful! Coco loves going for walks and has been walking five miles a day with his foster mom. When meeting new people while walking, he is always up for a friendly greeting and some petting. Coco also rides well in the car, but should be tethered to keep him in place. His trip to the vet went well. Coco had his nails trimmed and got his shots, all the time behaving like a real gentleman. He doesn’t even mind having his ears cleaned! Good boy! Positive reinforcement works well with Coco . However, he sometimes gets vocal when he is told to do something he is not happy about. When he gets on the couch following the resident dog’s lead and they are told to get down, Coco does get down but does so with some grumbling. There is no showing of teeth, but he does make it clear that he’s not thrilled about being told what to do. He is not aggressive, but is just vocalizing his objection. Young Springers need their exercise and, in addition to his lengthy walks, Coco gets plenty of exercise by playing with the resident 1.5 year old Springer, wrestling and chasing in the yard. If his foster mom throws the ball for him, Coco is more than willing to play catch. Since he does have a tendency to chew up toys, he does best with nylon bones. He does resource-guard his chew toys from the resident dog. The dogs are fed near each other and while Coco is very interested in eating the resident dog’s food, a firm “no” brings him back to his own bowl. Coco is a few pounds overweight, which he should easily lose with all of the exercise he is getting. When allowed off-leash, this moderate energy level Springer has shown good recall and doesn’t go far on the trails without checking to see that his foster mom is in sight. The two resident cats are getting plenty of exercise since Coco has joined their household; he likes to chase them, but he hasn’t hurt them physically, though. Coco would love a forever home where his people could spend a lot of time with him. This boy loves to cuddle and be close. He wouldn’t mind the company of another playful dog in his new house either! How about adding this bundle of sweetness to your life!